The Roberts family found the perfect solution for their 17-year-old son Trevor who has cerebral palsy and was in need of additional physical activity. 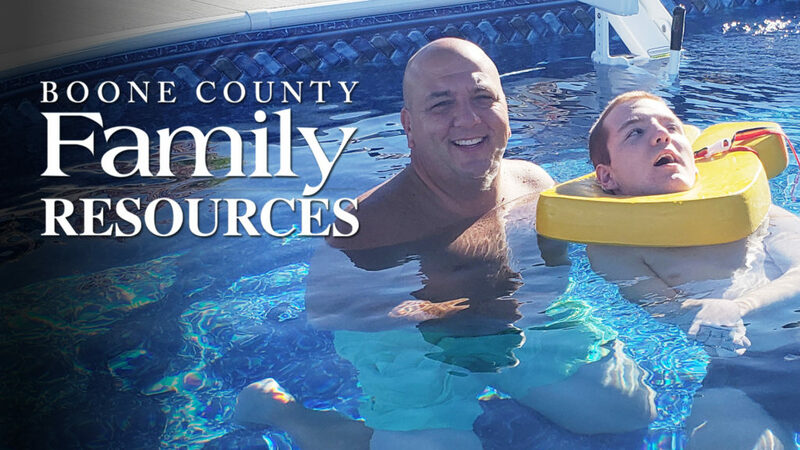 With assistance from Boone County Family Resources (BCFR), Trevor accessed DMH funding through the Medicaid Home and Community Based waiver for an adapted pool lift to engage in water activities with family and friends as well as support his health and safety, and he is loving every minute. Not having access to a pool lift excluded Trevor from participating in leisure and family activities of his choice at their home and community pools. The pool lift is necessary to prevent injuries to Trevor, his parents, and caregivers while transferring him in and out of the pool. Trevor has other friends in Centralia with limited mobility that also benefit from socializing and spending time together at the pool. While the need appears straightforward, the process to obtain the Environmental Accessibility Adaption services for the pool lift was a multi-step process. 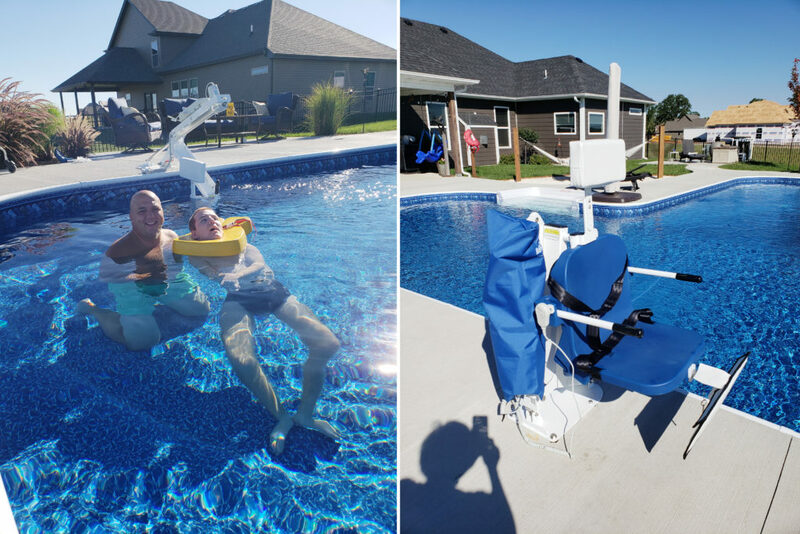 “The pool lift was approved and installed in the late summer,” stated Trevor’s Support Coordinator, Lisa Bailey, who stepped in to help the Roberts family coordinate their request. “Being in the water provides Trevor the opportunity to work on his gross motor skills, such as balance, body position, head control, posture and strength. In order to access the water, Trevor needs the pool lift to safely get in and out of the pool. Without the pool lift, Trevor and his parents are at risk for falling and injuries. Not only does the pool provide good exercise and opportunities to work on motor skills, the pool and the lift provide Trevor an opportunity to fully engage in activities with his family,” said Lisa. Tracie Roberts, Trevor’s mom, enjoys the ease of use of the equipment. “Trevor loves using his lift because he knows he is safely being placed and removed from the pool. The lift is battery operated. Trevor is placed in the lift seat and secured with all safety straps. Once secured we press a button on the key pad and the lift then begins its descent into the pool. From start to finish the process takes about a minute. It operates fairly slowly to maintain the person’s safety. When Trevor is ready to get out we just do the same routine in the reverse order,” said Tracie. Aqua therapy is a popular treatment for individuals diagnosed with cerebral palsy. Not only does the water provide an opportunity to spend time having fun outdoors and socializing, but the buoyancy lessens the effects of gravity providing joint relief and greater movement that would not be possible on land. Trevor’s parents installed a heat pump to their pool extending Trevor’s time in the pool from early spring to late fall. Trevor also accesses aqua therapy at school with his physical therapist who provides the Roberts with exercises he can do in his pool at home. Trevor Roberts and his dad enjoy time together in the family pool thanks to a pool lift installed last summer. While he does have physical limitations, Trevor is able to stay very active through water activities as well as participating in church events, going on float trips, therapeutic horseback riding and Challenger baseball. It is safe to say the lift has made a significant difference in Trevor’s life, and his parents are grateful for the continued support and assistance from BCFR. “BCFR has always met our needs. We are a very active family and want to include Trevor in all of our activities. We have been blessed by many opportunities and numerous pieces of equipment to help Trevor whether it was positional or recreational … Thank you, thank you, thank you for helping Trevor be as normal and as active as possible. We are forever grateful!” said Tracie.